Most of our intellectual ability began to develop in our first five years of life. Yet, many of us take for granted the intellectual stimulation we received in early childhood. Sadly, children with low-income, illiterate parents do not experience early childhood stimulation – the period when 90% of one’s brain develops. These children are already behind when they inevitably join low-achievement schools. They grow up to be functionally illiterate parents. Just like that, the cycle of illiteracy and poverty continues. Without early learning experiences and support for cognitive development, UNESCO estimates that more than 250 million primary school children cannot read, write or do basic math, resulting in great inequality and a loss for governments of approximately $129 billion annually. At least 25% of these children live in South Asia and more specifically, in India, where only half of 5th graders can read at a 2nd grade level. To combat this pervasive problem, Sneha developed ‘Dost’. Dost is an innovative approach to empower mothers in India to end the cycle of illiteracy. Dost, or “Friend” in multiple languages, is a mobile platform that aims to break the cycle of illiteracy by empowering moms to deliver early learning experiences to their kids. 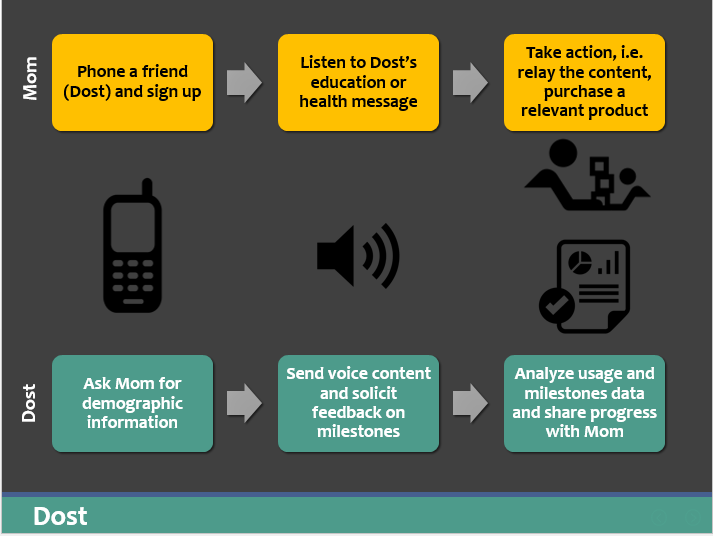 Through short, prerecorded voice messages delivered via an automated call to mobile phones, Dost enables all moms to give their kids intellectual stimulation using evidence-based approaches. The call is no longer than 2 minutes and contains: 1) Knowledge and tips related to child development and 2) Do it yourself home activities to promote number and language literacy. The call concludes with a touch-tone response question to collect feedback and user information. The idea of Dost won UC Berkeley’s round for the Hult Prize in early 2015, prompting Sneha to launch and pilot Dost with support from an Indiegogo campaign and the Rashell Young Fellowship. Through your support of the Rashell Young Fellowship, Sneha was not only able to conduct the pilot program, but she exceeded her fundraising goal by 33%! She partnered with a community-based NGO named CORP Mumbai to quickly scale the user enrollment from 5 to over 100 in one week. 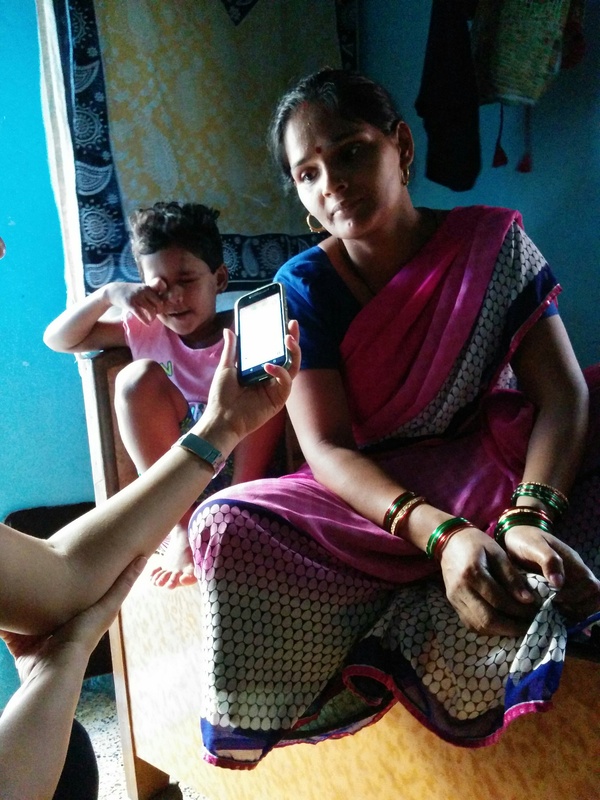 Analysis of Dost’s pilot in Mumbai slums found that 90% of urban mothers were willing to spend $1-3 per child per month for early childhood solutions and at least 70% of these urban mothers have their own (non-smart) mobile phone. Your generosity fueled Dost’s early stages and propelled it to where it is today. After the pilot, the team analyzed pilot survey data and usage data and conducted over 50 stakeholder interviews to determine next steps. At least four organizations with years of credibility and trust within their communities have expressed their desire to facilitate our next launch with at least 1,000 users. The team is currently fundraising to relaunch Dost with an improved product offering and that makes an impact. Currently, the Dost team is a 2016 Global Social Venture Competition Regional finalist and a part of the LAUNCH Accelerator at UC Berkeley.